Born in Omaha, Nebraska, Doris Stevens graduated from Oberlin College in 1911. She worked as a teacher and social worker in Ohio and Michigan before she became a regional organizer with the National American Woman Suffrage Association (NAWSA). In New York, she was friends with leading members of the Greenwich Village radical scene, including Louise Bryant and John Reed. In 1914 Stevens became a full-time organizer, as well as executive secretary, for the Congressional Union for Woman Suffrage (CU) in Washington, D.C. After working on the East Coast, including in Newport, Rhode Island, in 1913-14, she moved west to Colorado (1914), and then to California (1915). She organized the first convention of women voters at the Panama Pacific Exposition in San Francisco in 1915 and the NWP election campaign in California in 1916. Over the years, Stevens held several important NWP leadership positions, including membership on the executive committee. She served as vice chairman of NWP’s New York branch, spearheaded the NWP Women for Congress campaign in 1924, and worked in states where female candidates were among contenders for office. She also served as Alva Belmont’s personal assistant. Stevens was arrested for picketing at the White House in the summer of 1917 and served three days of her 60-day sentence at Occoquan Workhouse before receiving a pardon. She was arrested again in the NWP demonstration at the Metropolitan Opera House in New York in March 1919. Stevens published the quintessential insider account of imprisonment of NWP activists, Jailed for Freedom, in 1920. Stevens clashed with Alice Paul and led an unsuccessful attempt to challenge the leadership of Paul’s successor, Anita Pollitzer. 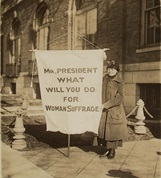 She was part of an internal dispute over the NWP’s emphasis on the World Woman’s Party and international rights rather than domestic organizing. During these tensions, a dissenting faction of NWP members tried to take over party headquarters and elect their own slate of officers, but Pollitzer’s claim to leadership was supported by a ruling of a federal district judge. Stevens parted ways with the NWP in 1947 and turned instead to activity in the Lucy Stone League, another women’s rights organization. In the 1950s she was a supporter of McCarthyism and anti-communism. In her last years, Stevens supported the establishment of feminist studies as a legitimate field of academic inquiry in American universities.